Several times during the past 10 years, friends asked us if we would use our 42’ Grand Banks for a sea burial of a recently deceased loved one. We naturally said yes. Though two of those events were far apart in time, there was an event on both that left me with a sense of awe and disbelief. Off the Southern California coast about three miles out, we stopped engines and turned the deck over to the family and friends to move through the service of their deceased loved one and say their final goodbyes. In both services, the ashes were spread from the transom by the designated family member. Watching the ashes swirling in the water was surprising and fascinating, since the particles turn a beautiful fluorescent silver float near the surface for an extended time. Along with flowers also tossed in the water, the effect was moving. Here is where the hummingbird enters the story. After the ashes were dispersed, in both services the group aboard Enchanter was joined by a beautiful hummingbird. Mind you we are three miles out at sea and there were no other boats in sight. Remarkably, the hummingbird didn’t just fly randomly around our boat. It purposefully flew up to the family members and guests – up close to their faces – hovering for a few moments and then moving to the next person. Whether you are religious or believe in things mystical, the effect of this tiny bird apparently communicating in such a lovely way was remarkable and something I’ll never forget. Since then I’ve asked fellow boaters if they had ever experienced this when participating in a burial at sea. A few said, “Oh yes,” and others mentioned that they had been visited by seals, who stopped their forward drive to stay near the boat for a spell. Whatever the explanation might be, the experience was truly special. 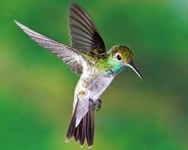 Today I see hummingbirds in a completely different way. Mike Dwight May 17, 2015 Category: Uncategorized.